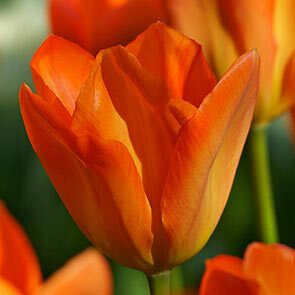 Liven up your garden with Orange Emperor Tulips. These luxurious flowers offer a bright, bold colour from early to mid spring. With blooms up to 10 inches in size, you will delight in the vibrant hues and classic tulip shape. With orange sherbet coloured petals and a soft yellow base, these spring flowering bulbs will quickly be one of the main focal points of your spring garden. 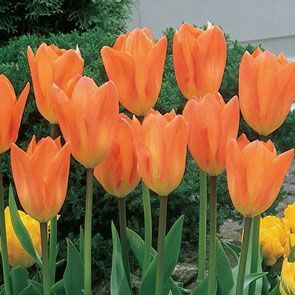 Tulipa Fosteriana 'orange emperor' offers the best results when they are planted in the fall in full sun or partial shade. Plant your Dutch sourced Orange Emperor tulip bulbs 6 inches deep and 3 to 6 inches apart in well drained loamy, clay or sandy soil. These hardy flowers stand 15 to 16 inches tall and produce massive 10-inch blooms in early to mid spring. These beautiful perennial flowers are hardy in zones 3 through 8 and will return to your garden year after year. These spring flowering bulbs create a dramatic effect in any garden, especially when paired with tulips of other colours. Create a tulip cutting garden or line walkways and borders with these beauties. Tulips also make great container flowers; combine them with daffodils and hyacinth to enhance your deck or patio. Bring a touch of elegance and beauty to your yard with Orange Emperor tulips. Prodigious blooms of orange and yellow. Among spring's first flowers, Orange Emperor Tulips are truly royal classics and a special favourite in Holland! Huge blooms have glowing orange petals with a pale yellow base inside and measure up to 10" wide when fully opened. Flower Form 10" wide when fully opened upright, double, bell or funnel shaped.